Even if a customer deletes the data off the flash drive, the company logo is still branded on the device. Always in the customers face, always reminded them where they got the drive. Maybe it’s the process of data loading the information onto the drive on why flash drives haven’t become more popular with companies for handing out information. It’s a very viral gadget. The USB duplicator is an obvious choice for making such a life, much easier. The Nexcopy USB duplicator is a 20 target system and the company says a 5 minute mpeg video (about 30MBs) can be copied in about 40 seconds. This means the USB duplicator can churn out [estimated] 1,200 drives in about 1 hour. I’ll have to back that number down considering swapping the drives, the OS identifying the drive etc. But even so, the USB duplicator turns a miserable task into an easy process. USB music albums are becoming a much bigger hit these days as well, and having a USB duplicator to make your album definitely speeds up the process from a hub and copy-n-paste. I know you can put the following information onto a CD or DVD, but for the groupies, something unique like a flash drive is just ideal. Putting your band video, back story interviews, lyrics etc. onto USB is a new way to give a bands fans something unique. The other advantage with making a USB album is increasing a bands margin on selling promotional items. Your 20% margin is a lot more in dollars with a $25 USB drive than a $10 T-shirt or $7 CD. So again, the USB duplicator concept isn’t for the masses, but is a great idea for the select few. Speaking of which – are you [or someone you know] part of the select few? 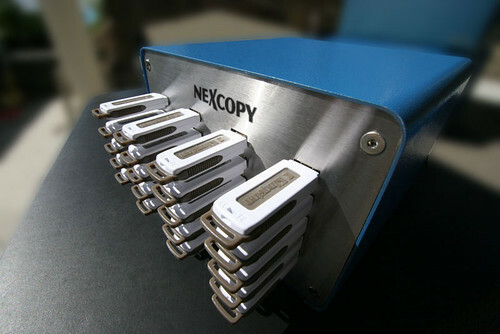 If so check out the USB duplicator from Nexcopy.